The woman at the centre of a frenzy over a recent photograph taken during protests in the US has taken to social media to thank people for support and attribute her actions to God. 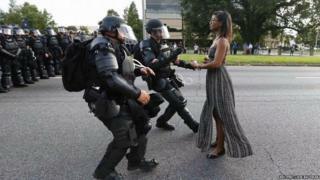 The picture, showing Ieshia Evans calmly standing in front of two heavily body-armoured police officers during a #Blacklivesmatter protest in Baton Rouge, Louisiana, went viral at the weekend. Ms Evans has responded to the furore via Facebook, where she said: "I appreciate the well wishes and love, but this is the work of God. I am a vessel!" The photo garnered messages of respect and admiration from friends and supporters on her Facebook wall. And strangers on Twitter offered words of praise using the terms #BlackLivesMatter and #LeshiaEvans. Many on social media felt that this was a remarkable moment captured on film and compared it to another iconic image from almost 30 years ago. Others, however, were less convinced of the image's importance.